This easy bisque recipe is both flavorful and comforting for the cold winter season. Enjoy! Place the shrimp shells and seafood stock in a saucepan and simmer for 15 minutes. Strain and reserve the stock. Add enough water to make 4 cups and reduce it to about 3 cups. Meanwhile, heat the olive oil in a large pot. Sauté the leeks over medium-low heat until the leeks are soft but not browned. Add the garlic and cook 1 more minute. Add the cayenne & shrimp and cook over medium to low heat for 3 minutes, stirring occasionally. Add the Cognac and sherry and cook for 3-4 minutes so the alcohol cooks off. 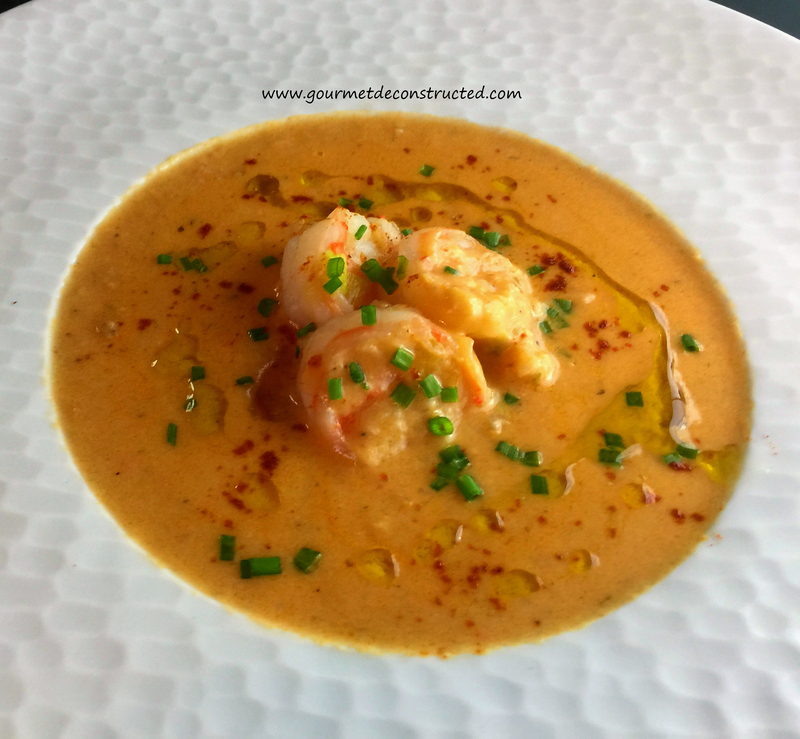 At this point you can separate about a quarter of the cooked shrimp for the finished product (optional) and transfer the rest of the shrimp and leeks to a food processor fitted with a steel blade and process until coarsely pureed. In the same pot, melt the butter. Add the flour and cook over medium heat for 2 minutes, constantly stirring with a whisk. Add the half-and-half and simmer, and whisk until thickened, about 3 minutes. Stir in the pureed shrimp, the stock, tomato paste, salt, and pepper and simmer gently until gets hot and thickens a bit. Season, to taste, and serve hot in bowls topped with 3-4 of the reserved shrimp, and garnish with chives. Bon Appetit! Posted on January 18, 2017, in Seafood and tagged cognac, dry sherry, Leeks, seafood, seafood soup, shrimp, shrimp bisque, soup. Bookmark the permalink. 3 Comments. Looks delish as usual Chef! I’m gonna make this Bisque this week! Gotta get me some more skrimps today! You continue to amaze! Camel meatballs? Come on Chef! Who does that? Way to think outta the box!!! You da bomb and keep up the awesome work! Inspire so others aspire! Great work Justice. Delighted to see you go so far.